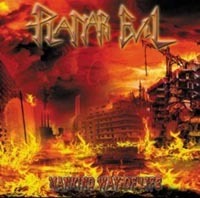 Speaking of familiar sounds: Planar Evil is another Italian band that has seen the light in the old school of Thrash metal. To my ears, vocalist Mark Evil sounds a lot like Chris Astley from Xentrix (remember the British band who did a great cover of the Ghostbusters theme? ), i.e. not necessarily everyone’s cup of tea. Musically, I have to categorize ‘Mankind Way of Evil’ as good-times-party-thrash played the way we’ve heard it about a zillion times since 1986 from mostly German bands. You guessed it; not very original, but with a good portion of conviction. The album is definitely worth checking out if you dig old-school thrash only. I can control my enthusiasm, though.